Because of this, if a circus fire occurs, the elephants usually perish. Though they have the great physical strength and means to escape, their minds cannot grasp that they can break free even to save their life. For a long time, this described my career mind-set. I would repeat the same career goals year after year, but I was not pursuing my true goals and dreams because of exhaustion, confusion, and fear. We are only human. We easily find ourselves in situations where it can feel like there is no escape, from demanding bosses/jobs to unhealthy relationships, from fad diets to misguided finances. Regardless whether our road to safety may be two steps or a thousand steps in front of us, the heavy weight of discouraging thinking can bind us down and keep us trapped. In turn, we are also capable of realizing that this learned helplessness is just an illusion. We can start by developing what Anne Kreamer, author of Risk/Reward: Why Intelligent Leaps and Daring Choices Are the Best Career Moves You Can, calls “a habit of mind.” You don’t have to quit your job on a whim or launch a product without a competitive analysis to test your courage. 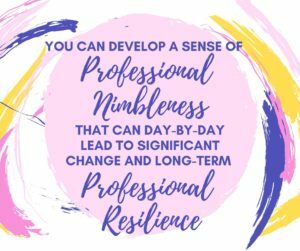 Instead you can develop a sense of professional nimbleness that can day-by-day lead to significant change and long-term professional resilience. That means getting out of your comfort zone and networking/making new contacts. It means speaking with your bosses and supervisors more and building curiosity. It means if you feel undervalued, you do not sit idle in the corner. Instead, you stick your neck out, think beyond where you are, build your skills, and accept that you may fail. When setbacks happen, you will get back up and try again. Over time, you build a state of mind that becomes flexible and resilient. Once you embody this “new” career philosophy, problem-solving becomes your norm and your every thought and action becomes adaptable to change. We are constantly reminded that we live in a world that is constantly changing – industries are disappearing, new technologies are emerging and customer needs are evolving. As communication professionals, Julie and I have learned to embrace the changes, and are constantly skill-building and most importantly, developing new relationships. This flexibility and career resilience is a state of mind/philosophy that our bond is based on, and has prepared us to thrive together in the coming year.